A drive down any of New Jersey's older state highways brings an interesting mix of old and new structures, especially in the western parts of the state. Decades-old roadside eateries and supply stores are interspersed with new developments built on acreage that until relatively recently was farmland. It's kind of off-putting to see a brand new big-box strip mall paired with a newish residential development in that environment, but that's the new reality around the state. Once in a while, though, you get a surprise if you're observant. That was my experience on a recent drive on Route 31 in Warren County. Between a settlement of mega houses and a recently-opened Shop Rite was a stone structure that looked suspiciously like a lime kiln. Was this a real, honest-to-goodness oven that converted limestone to fertilizer, or was it some sort of homage to past industry in the region? 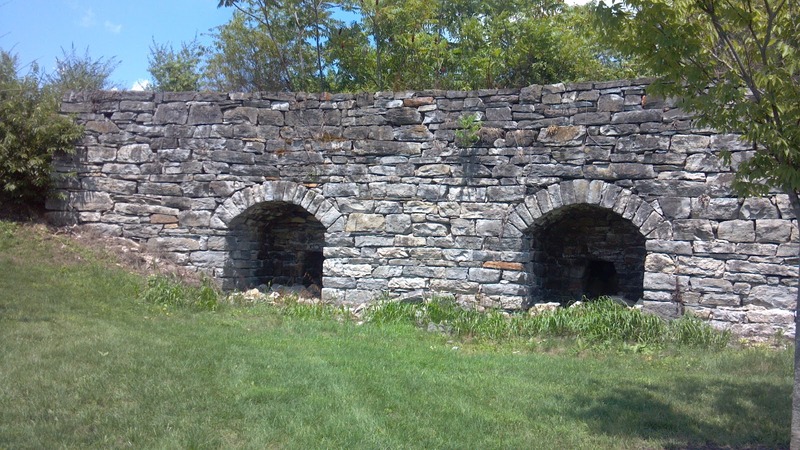 Longtime readers will recall I ran into several lime kilns during my wanderings in Carpentersville, also in Warren County. While those represent the largest cluster of kilns in the state, they also show their age and are protected from development by an easement granted to the New Jersey Conservation Foundation. Conversely, the Washington structure looked way too good, way too well-tended to be legit, and the lawn around it was nicely manicured. I stopped to check it out, but the site was unmarked, leaving no explanation. No doubt, many people probably drive by without knowing what it is or might be. The mystery was solved when I checked my reliable WPA Guide to New Jersey. Apparently the kiln is completely legit, having operated until 1920, which may explain why it's in good shape compared to many of its counterparts in New Jersey. Its proximity to a major road might have also prevented vandals from defacing it or stealing its cut stone blocks for other uses. Today, the Washington kiln looks like a decorative wall built into a hill along a sloping access road to the supermarket. I noticed some landscaping lights that might highlight the structure at night, which seems ironic, now that I think of it. If other kilns have suffered from being illegally dismantled to harvest landscaping brick, there's some justice to this beautifully-intact kiln remaining in place as a desired enhancement to the property. I am told that this kiln is the reason that route 31 is so close by- this was fertilizer as an industry, which is why the kiln is much bigger than the ones on individual farms.